Carpentaria Shire, an area of 64,381 sq km, adjoins the south-east shoreline of the Gulf of Carpentaria. Cook Shire (Cape York Peninsula) is on its northern boundary and several shires, mainly Croydon, are on its southern boundary. Named after the Gulf, itself named in 1623 after the Governor-General of the Dutch East Indies, Pieter de Carpentier, the shire was proclaimed in 1903. Prior to then the Carpentaria divisional board (1883) had been the regional local authority. The report of William Landsborough's expedition (1861) in search of the failed Burke and Wills exploration brought an influx of pastoralists to the Gulf region. Burketown on the Albert River tended to be fever-ridden, and Normanton on the Norman River became populated in the late 1860s. It was later a freight centre for Etheridge, Cloncurry and Croydon mine areas. The Queenslander-style shire offices in Normanton were built in 1890, and a railway from Normanton to Croydon was opened in 1891. The shire's other main town is Karumba at the mouth of the Norman River. The vast pastoral estates often form chains through which livestock can be fattened or moved, depending on seasonal conditions. There have been intermittent meatworks at Normanton and the port of Karumba, but live cattle export has proved to be better. 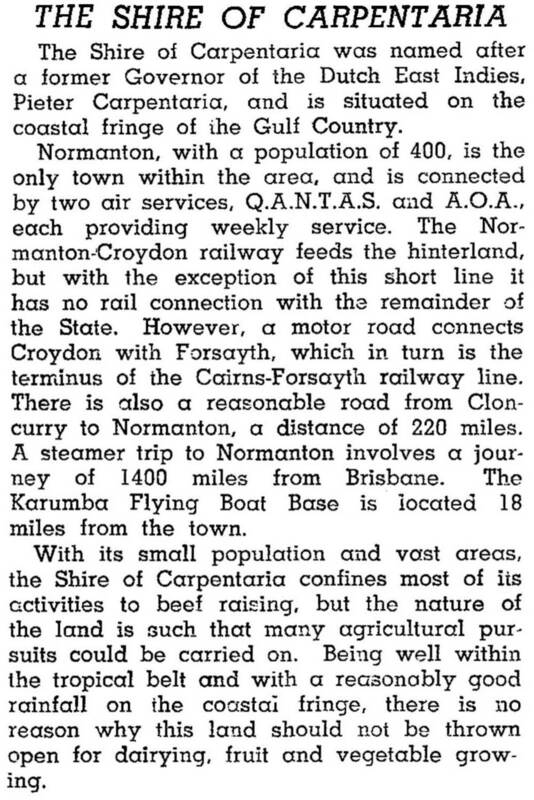 Both Normanton and the shire lost population in the years after World War II; some people who had been evacuated because of the risk of Japanese invasion had no reason to return. A slight upturn came when basic tour and fishing facilities were installed at Karumba, and prawn fishing (1960s) and improved road access for tourism brought Karumba's population from 359 to 1043 between 1971 and 1996. The Matilda Highway brings tourists from as far south as Cunnamulla, passing through numerous outback towns. Karumba's port was enlarged in the 1990s for the export of zinc-lead concentrates piped from the Century mine at Lawn Hill. In 2001 the shire's largest employment sector was government and defence (33.7%), followed by agriculture and fishing (15.0%), wholesale and retail (7.8%), education (6.3%), health and community services (5.6%) and accommodation and hospitality (5.0%). The pastoral economy was exclusively beef cattle, with over 307,000 head being recorded in 1993. At the 2011 census, sheep, beef cattle and grain farming made up 20.1% of employment, followed by local government administration 6.4%, metal ore mining 5.9%, education 5.4% and accommodation 4.1%. Aboriginal and Torres Strait Islander people made up 36.8% of the population. 1 Including an estimated 1136 visitors.